I have found a way to get a little thrill out of grocery shopping. It is a simple act of kindness that only costs 25 cents that brightens my day. Grocery shopping is not high on my list of favorite activities. As a family, we are trying to eat healthier and all those fruits and veggies are expensive. Which has lead me to do some shopping at the discount grocer Aldi. Aldi is a German company now based in Illinois with over 1,600 stores in the U.S. It was kind of a big deal when one opened in our neighborhood. If you’ve never shopped at Aldi it takes some getting used to. 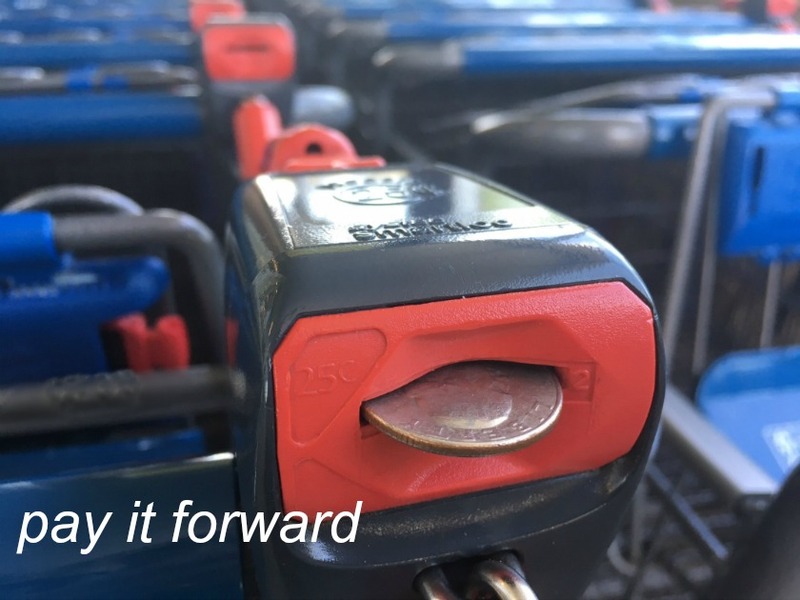 To start with the carts are locked together outside the store, you unlock your cart by inserting a quarter and when you return the cart your quarter is returned. But I don’t want my quarter back. I get a small thrill out of giving my cart to someone in the parking lot. As I walk from the store back to my SUV I scope out those shoppers just arriving. I keep a watchful eye out for a frazzled mom with littles in tow or an elderly couple, those are my favorite targets. Over Memorial Day weekend I was lucky enough to find an older gentleman with veteran license plates parking in a handicap space – jackpot. Once I find my recipient I quickly unload my cart and speedily walk back toward the store. I approach my target and ask if they’d like the cart. Typically they respond with yes and offer me a quarter. I refuse the quarter and tell them to have a nice day. We exchange smiles and go on our separate ways. The mom can load her baby and reusable bags into the cart and her load is lightened. The elderly couple has a cart to lean on as they walk. It is a small act of kindness that always seems to be met with surprise. It is a small act gesture that always seems to be met with surprise. It’s that simple. It isn’t about saving anyone a quarter. Although sometimes not having to search for that last quarter from the bottom of the purse is a gift in itself. It is about extending some kindness in a world that sometimes feels void of it. It is a brief connection with a stranger. It is about slowing down for a second and thinking of someone else. It is always my hope that as they leave the store they look for someone to give their cart too. My wish is that this little act sends out a bigger ripple. We are all busy running from thing to thing and place to place. There have been and will be times when the person you are kind to is too busy to notice. We’ve all had those days or seasons when a constant state of overwhelmed is where we are. Don’t let their distracted state discourage you. People may be put off by your kindness. People may wonder what you’re up to and what your motives are. How sad it is that people are sometimes suspicious of kindness? Think about that for a moment. Don’t let their weariness deter you. You are on a mission. There is much kindness to spread. Our world would be a better place if we all looked for opportunities to be ripple starters. Slow down enough to hold the door open for the person behind you. Buy coffee for the person behind you in line. Take a breath. Smile. Make eye contact with someone you don’t know. Do something kind, no matter how small and expect nothing in return. Loved this. It is such a simple thing to do. If we all look for more of these little things to do that are kind, we could have a sunami of kindness. It is also helpful to know that when I finally get to an Aldi’s, I will need to have a quarter.